This article was first posted in East Asia Forum on 7 February 2011. The precariousness of Pakistan’s future political and economic stability was highlighted no more starkly to outside observers than by the assassination of Punjab’s Governor, Salman Taseer, by his own bodyguard, offended by Taseer’s public support for review and amendment of Pakistan’s Blasphemy Laws. It wasn’t the assassination itself so much, vile and treacherous though that would have seemed to many, but the outpouring of support for the assassin and the hundreds of legal volunteers that offered defence of him that shocked the rest of the world so deeply. Sometimes we feel such dismay and anger at the expressions and acts of intolerance and hatred that confront us daily, so graphically in these sharp-focused digital days, in societies all around the world that we may be forgiven for despairing that such acts will render the prospects of peaceful or prosperous life impossible for the vast majority of humankind. Pakistan is a nation that currently induces such despair. 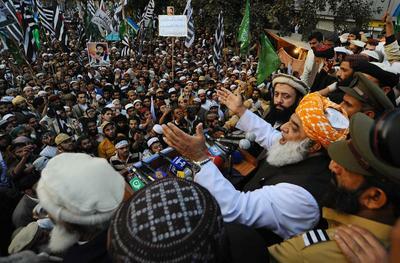 Riven by division between exclusionary Islamists, influenced by extremist views born in Saudi Arabia, and the traditional syncretic and spiritual Muslims influenced by the moderate Barelvi school of thought of India, and representing the largest single religious group in Pakistan, the daily threat of violence from the extremists has effectively silenced the majority. Political leaders, intellectuals and opinion-makers alike have been cowed and the extremists have steadily increased their hold over public discourse. Even the majority religious leadership has been threatened. Pakistan is a nation, as Nawaz and Khan so eloquently explain in this week’s lead essay, at war with itself. This fratricidal ‘war,’ of course, has enormous consequence for how Pakistan behaves towards its neighbours in Afghanistan and in India and whether it can contribute to building stability in West Asia or is condemned to assisting its destruction. Huge resources have been ploughed into supporting Pakistan, from the United States and elsewhere, in the hope of shoring up resolve against extremism at home and in the neighbourhood. These external benefactions are important but they alone cannot resolve the crisis that confronts Pakistan today. Much more important is the emergence of national political will to confront a house divided against itself. Nawaz and Khan say that the Pakistan army, ‘the strongest and most disciplined institution in the country, is not ready to step into the political arena to change things on the home front’ even though it has won ground against the insurgency in the borderlands although here in Australia, former Prime Minister Bob Hawke is beginning to urge ‘fixed term’ military rule as the only way through the Pakistan crisis, which he identifies as the greatest threat to regional security. Success in this desperate Pakistani battle will depend as much as anything else on whether the economy can be turned around, and dismal economic growth (of 2 per cent a year in recent times) can be lifted to something more like that in China (8 per cent or more) to provide employment and income for increasingly disaffected youth. Growth and prosperity are powerful forces in marginalising discontent and strife. Pakistan has the talent, the professional infrastructure at the top, and an agenda for economic reform that, given the chance, could make the difference. But in the end that chance now depends more on political will, not only nor mainly to get the take on economic policy reform right, but also to do what Salman Taseer did, against his own Party and many of his people, to speak out for reasonableness and tolerance in dealings with his fellow Pakistanis.